In my previous job I used to travel to Hong Kong twice a year. Great place to go out, but not great shopping: all overpriced luxury brands or, at the other end of the spectrum, hard-sell tailors that would offer a ‘bespoke’ suit in 24 hours. So it was just my luck that the year I stopped visiting, Mark Cho set up The Armoury, a great menswear emporium just across the road from the office, in the Pedder Building. Like any good emporium, it is a focused selection by a man with uncompromising views. It also stocks some familiar names with some less familiar ones. So alongside Drake’s, John Smedley and Gazinao & Girling, we have Florentine tailor Liverano & Liverano, Spanish shoemaker Carmina and glasses maker Nackymade. I know Carmina fairly well, but not Liverano or Nackymade, so it’s fortunate that both will be in London at the end of this week as part of an Armoury pop-up shop. 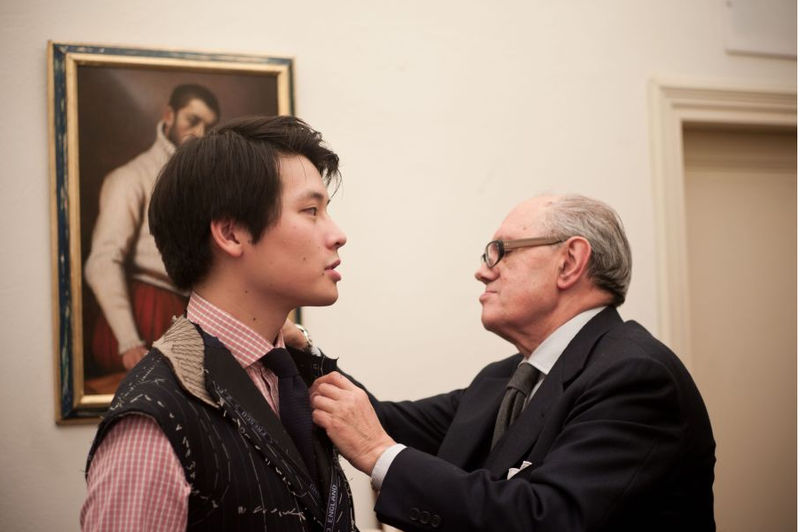 Antonio Liverano (top), founder and head cutter at the bespoke tailor will be there to show off his work and take any orders that men are inspired to make. And Naoki Nakagawa, the craftsman behind Nackymade glasses, will be equally receptive. Liverano’s tailoring style is described as closer to the Milanese style than Neapolitan, being clean and sharp in construction, but with a certain unique eye for texture and colour – classic without being dowdy is the phrase used. Nakagawa, on the other hand, is a one-man operation from Kobe who specialises in bespoke designs and sizes – if you have trouble finding glasses that fit, he may be worth a visit. The shop will be at the Rook & Raven Gallery, 7/8 Rathbone Place, just north of Tottenham Court Road tube, from this Friday to Sunday. The plan is that all Armoury artisans will visit over the next few months, and obviously the tailors will be back for fittings. 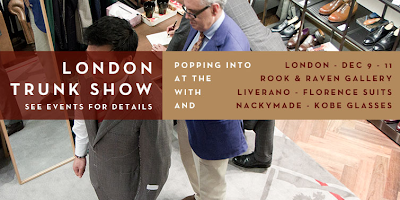 You can follow the discussion on Liverano and Nackymade at The Armoury in London by entering your email address in the box below. You will then receive an email every time a new comment is added. These will also contain a link to a page where you can stop the alerts, and remove all of your related data from the site. Neapolitan tailoring is the most different from an English style: very soft, little or no shoulder padding, often a sleeve shoulder, a lot of curve to the outbreast and hip pockets. Milanese retains some of this softness but is more similar to English style in its sharpness of cut and classic shoulder line, sleeve attachment etc. Simon, You say you know Carmina (Albadalejo) “fairly well”. How do their shoes compare in your opinion with Vass, G&G, EG, etc.? I’ve been to their stores in Madrid a few times, talked to the management there and tried the shoes on, but I don’t own a pair – so I don’t think I can make a straight comparison with EG, G&G etc.